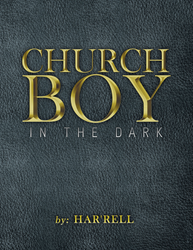 Recent release “Church Boy in the Dark” from Page Publishing author Har'rell is a captivating tale that begins with a young child, his profound awareness of his sexuality and his desire to experience the street life despite his middle class upbringing. Har'rell, a passionate author and writer, has completed his new book “Church Boy in the Dark”: a gripping fact-based fiction filled with vivid illustrations of life and death using real places, letters, and conversations. Published by New York City-based Page Publishing, Har'rell’s intriguing tale is a story of acceptance of one’s fate and purpose to serve God and glorify his name for the good of all, especially during times of sorrow and overwhelming unpleasantness. This book features articles containing thorough explanations of sexuality and salvation that are worth reading, and that which requires an open mind and heart for a deeper understanding. Readers who wish to experience this fascinating work can purchase “Church Boy in the Dark” at bookstores everywhere, or online at the Apple iTunes store, Amazon, Google Play, Kobo, or Barnes and Noble.